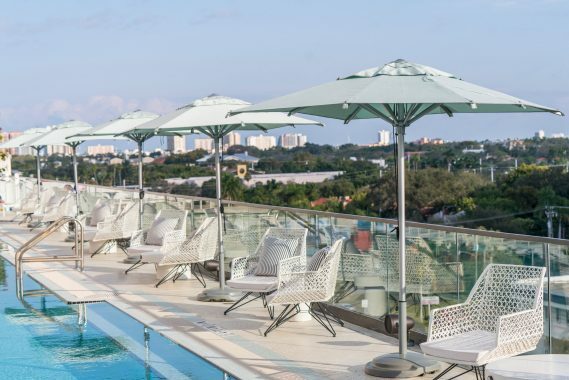 DoveHill Capital Management and Wurzak Hotel Group today announced the opening of The Dalmar, a first-of-its kind hotel property in the heart of Fort Lauderdale. This new build lifestyle hotel launches as part of the Tribute Portfolio, Marriott International’s newest collection brand and growing global family of characterful, independent hotels drawn together by their passion for captivating design and their drive to create vibrant social scenes for guests and locals alike. Standing 25 stories tall and conceptualized by the DoveHill team, The Dalmar features interior design and branding by acclaimed global design firm, DesignAgency; five distinctive food and beverage concepts, including the city’s highest rooftop bar; an infinity pool; fitness center; 14,000 square feet of flexible indoor and outdoor meeting and event space; and Yoga Joint, South Florida’s premier yoga studio. 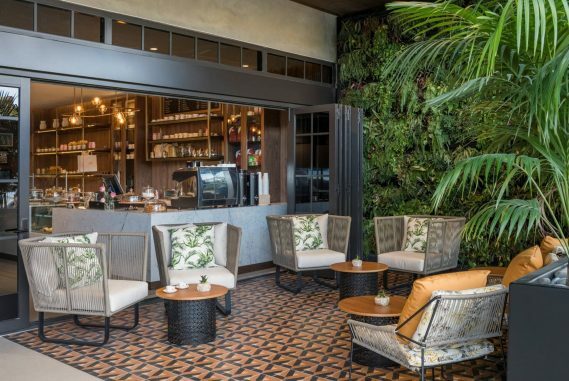 Inspired by the vibrant culture of South Florida, blended with a distinctively California mid-century vibe, The Dalmar offers guests a uniquely relaxed and tropical environment in an exciting downtown location. 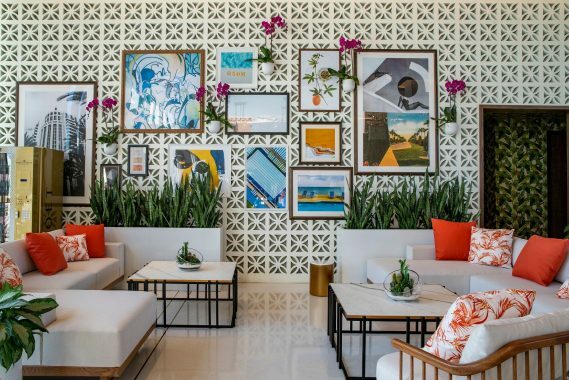 The hotel’s public areas express a fresh and playful character through their layering of textures and finishes, vibrant jewel tone colors and dynamic contemporary art. 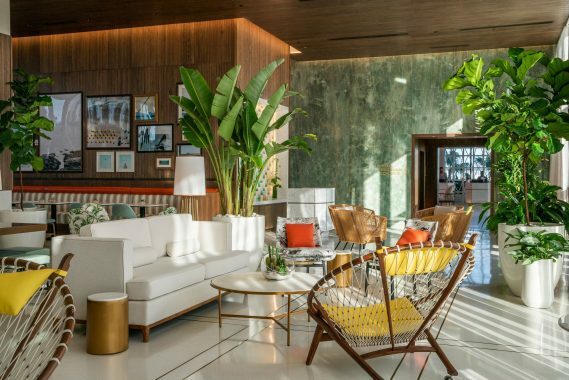 Capitalizing on the natural beauty of Fort Lauderdale, the hotel’s indoor-outdoor design offers visitors an authentic downtown experience with ocean views. 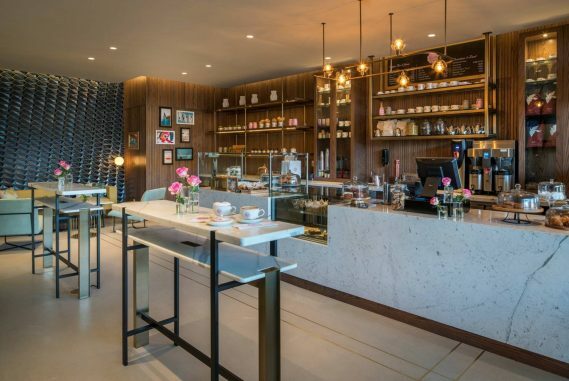 Beginning at the arrival level, Rose’s Coffee Bar offers guests a first taste of the culinary outlets, featuring premier coffee from La COLOMBE and delicious fresh baked goods. 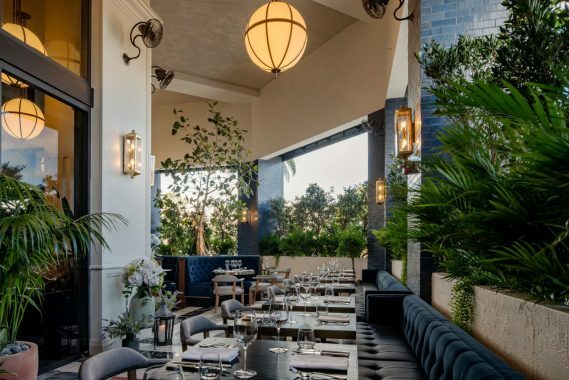 Upon arrival on the sixth-floor, visitors are treated to a wrap-around lushly landscaped sky deck with ocean and downtown views. 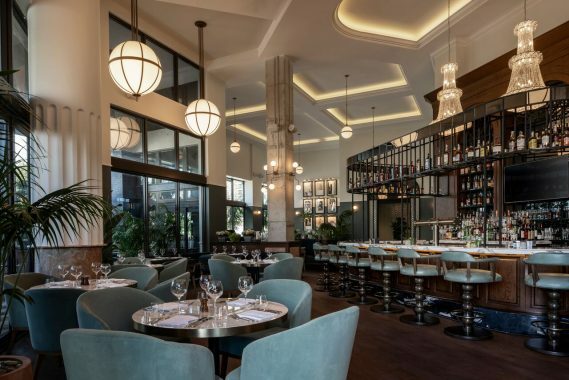 The Lobby Lounge and Bar offers a relaxed atmosphere with live music on weekends and a specialty cocktail menu. The pool area features cabanas fitted with custom furnishings, a state-of-the-art sound system and Sip N’ Dip a high energy pool bar. 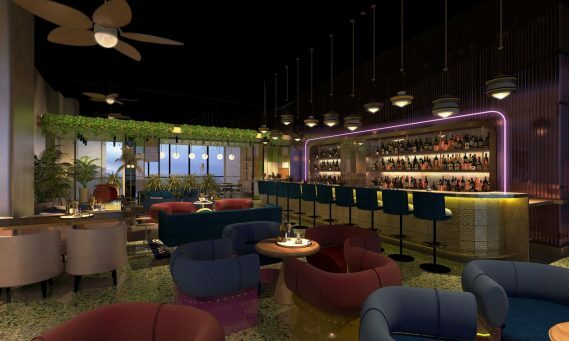 The centerpiece of the action, the Lobby Bar, mixes an array of tropical style references including terrazzo floors an array of comfortable lounge seating options, and a luminous pink onyx bar with a custom-designed stained-glass mural. 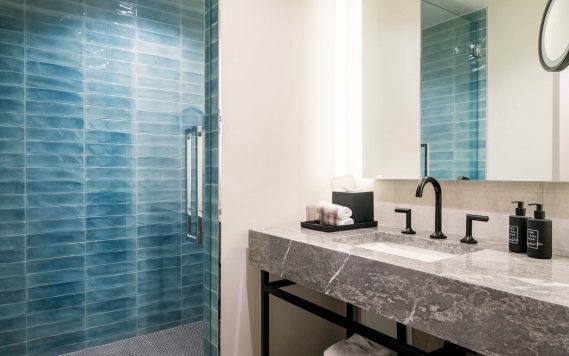 The property features 209 stylish guest rooms, including 33 suites all featuring iPad technology, keyless room entry and in-room Amazon Alexa automation. The guest rooms and suites are outfitted in neutral tones, rich leathers, natural woods and marble bathrooms. Smart technology allows guests to order room service through iPad. 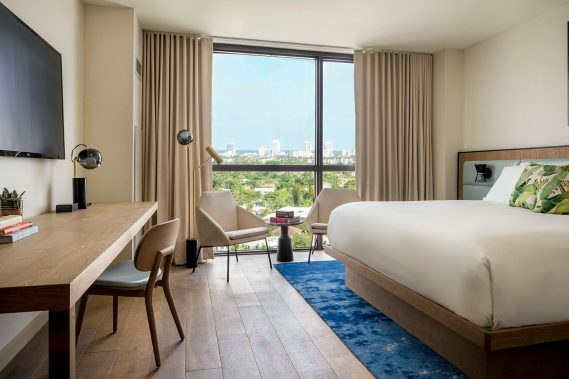 Additional in-room amenities include curated artwork inspired by photographer Slim Aarons, exclusively scented bath amenities curated and designed by the hotel, rainfall showers, 55-inch HDTV flat screens and 65-inch TV’s in all suites, and luxurious Sferra bedding and linens. 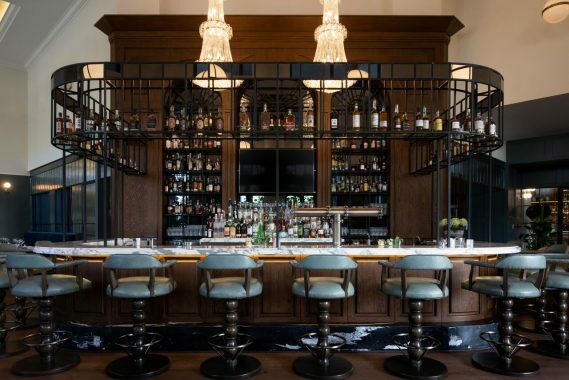 To celebrate the grand opening, The Dalmar Experience Package includes a $50.00 food and beverage credit to be utilized in three venues; The Lobby Bar, Sip N’ Dip Pool Bar and The Terrace Grill. The Dalmar is located at 299 N Federal Highway, just minutes from Downtown Las Olas and Fort Lauderdale’s best beaches. The property is conveniently centered between Florida’s three international airports and Broward County business districts. Complimentary shuttles to and from the beach and city center will be available along with bikes to rent. Rates starting from the mid-$200 range with rates climbing into the $500’s in season. For more information, visit www.thedalmar.com or call 954-945-9500.